We pack product in White corrugated plastic Box. Our products are designed and crafted by the finest artisans, with incomparable skills. We bring you a vast range of exclusive traditional Handicrafts. Our handicrafts reflect India’s rich cultural heritage and are honed through generations of family skill. 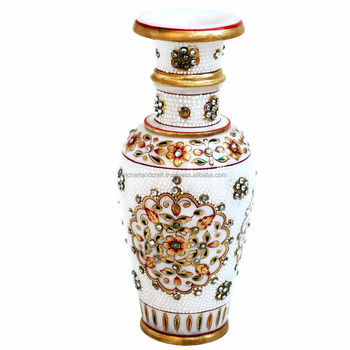 A dazzling vase with a dazzling design that has been hand painted with red, green and a gilded leaf and the beauty is enhanced with the multicolour kundans. This piece looks great as a centre piece on a table or in a showcase..